training military personnel. Unfortunately, permitting requirements would have encumbered the construction of stick-built structures. In addition, the high cost and time-commitment associated with creating a stick-built training village were unideal. The U.S. Air Force needed realistic, yet cost-effective structures that could be quickly approved and assembled. Modified shipping containers, a product already approved for military use, as base modules. Realistic finishes on the container’s exteriors. 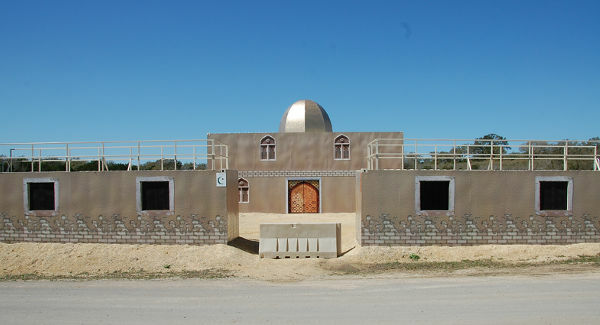 Falcon Structures built a mock container village, complete with staggered doors, walls and windows to replicate homes and businesses in the troops’ region of deployment. 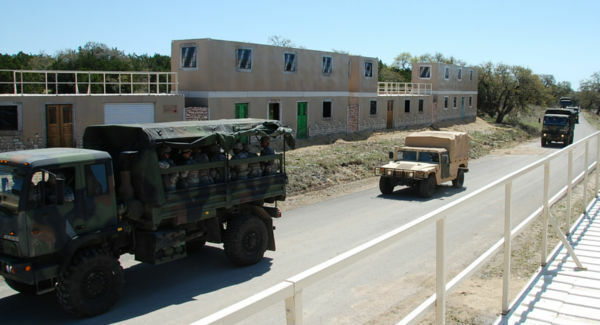 The MOUT village also included a improvised explosive device (IED) training lane, where soldiers could practice responding to road side bombs.Our modified shipping containers are quickly reconfigurable. Container versatility enables the U.S. Air Force to create countless scenarios on-demand. Our solution was delivered at a fraction of the time and cost associated with building a stick-built village on their own. Another key benefit: shipping containers are already approved for military use, which helped expedite permitting. Have questions about container-based MOUTs? Give us a call at 877-704-0177 or email sales@falconstructures.com.